We are knee deep in Christmas preparations now and it is very hectic! Kidlet has one more day of school before winter break and he is very excited. 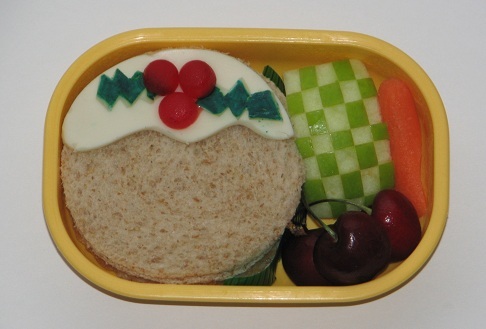 Today's lunch was a Christmas Pudding bento! Still trying to decide on tomorrow's lunch! Christmas Pudding is a soy chik'n patty sandwich with cheese icing and dots as the berries. On the side are checkered apple, carrot, and cherries. This is what my kitchen table looks like right now! 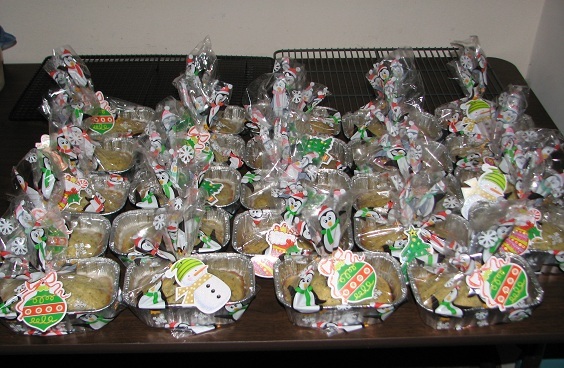 24 mini loaves of Almond Poppyseed Bread all packaged up for Kidlet's teachers tomorrow! The Christmas pudding sammie looks great! I've never had one, but now I want to try one :D The teacher's gifts look fabulous, that must have been a crazy amount of work!